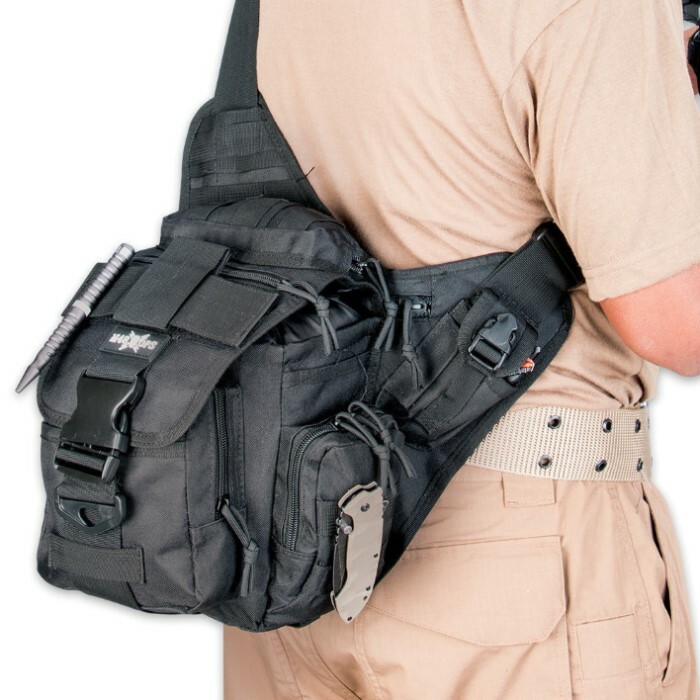 M48 OPS Tactical Waist Sling Bag - Messenger - Black | BUDK.com - Knives & Swords At The Lowest Prices! Carry all your tactical gear discreetly and transport it with ease using this brand new M48 OPS black military-style tactical waist bag. The over-the-shoulder sling design offers a padded strap that is easily adjustable for a custom fit. The large inner compartment provides a holster feature for a handgun plus lots of additional storage and organization. Additional compartments and pockets will hold tons of other tactical gear, and the MOLLE webbing on the exterior allows for simple attachment of other types of gear. The sturdy, 1000D nylon construction is heavy duty and built to last, with extra padding on the backside for a comfortable carry. What a versatile, easy to carry, gear bag. Large water resistant inner compartment fits my iPad perfectly. A place for everything. The large Velcro patch strap? This has worked out great to strap my 3D Mag Flashlight, attach small strap around flashlight then stick the large pad to pack. The flashlight can be pointed ahead while carrying, I like this better than headlamp. Cool bag! I love this bag. I'm amazed at all the room. I have everything in it. No clue about what the big velcro strip is for. Any ideas? I use this bag to carry rifle magazines with me when I go target shooting in the woods. What makes the M48 Ops sling bag different and better than most other bags is the way it hugs my body when walking through the woods. The shape and placement of the shoulder strap keeps the bag from swinging out and back into me when hiking through rough terrain. Very sturdy construction and comfortable to wear on day hikes. I recently purchased this product, and after searching for a few days, I still haven't found that darn built in holster?? I'm a small game hunter and my hunting weapon of choice is the slingshot so read on and I will give my review. 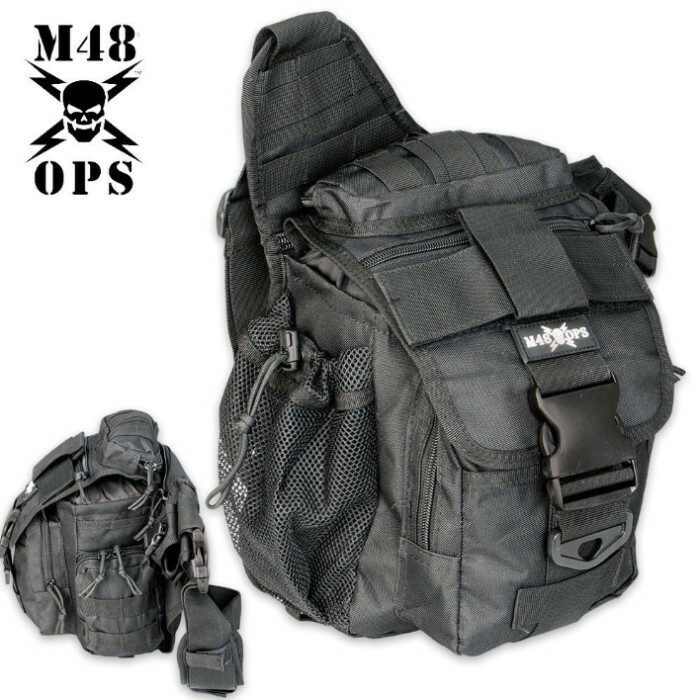 I ordered the green version of this M48 Tactical Waist Bag Back Pack recently. I took a chance on it while it was on sale and I must say that I was not let down. It is a great bag which for being smaller can carry as much as "essentials" as a standard sized back pack, the thing with packing essentials for either a day hunt a hike is understanding how to negotiate the space in your bag. 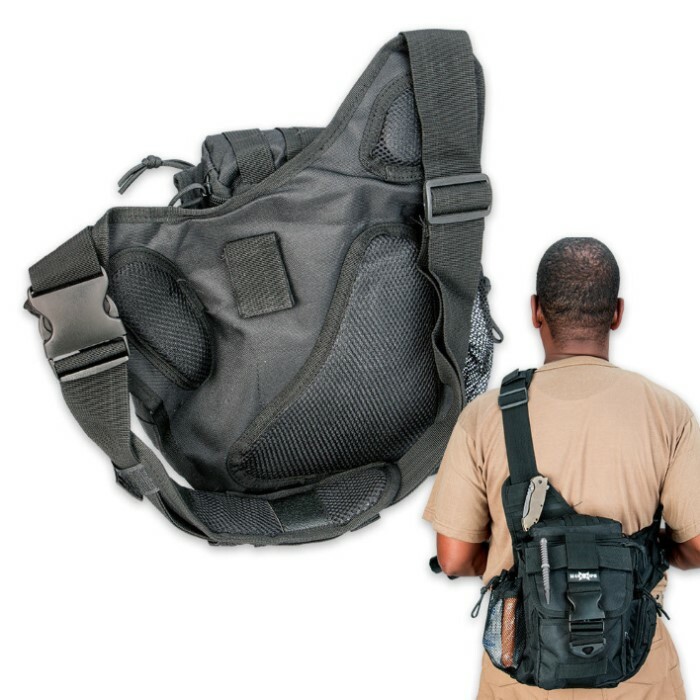 I bought the green version of this waist/shoulder pack to be a larger back up to an old Mp3 Gas Mask bag (Polish Military issue) I picked up at a surplus last year. That old bag has been my go to hunting bag and it can carry 4.2 liters and it is a workhorse but it is made of canvas and highly susceptible to an even light rain and needs to be protected inside a plastic bag in rainy weather. But this M48 Gear Tactical Waist/back pack is water resistant and the main compartment still carries slightly over 2 liters (perfect for a thermos or a aluminum trail blazer cup) and the bonus is that it has other pockets that make up for the lack of more space in the main pocket. A good sized pocket is at the backside which you can fill with instant coffee and or dehydrated (instant meals) like sopa packets, or even ramen if you like that stuff. It has many other pockets which I will be able to load with my hunting essentials from the ammo to my back up slingshot and the tools needed for the hunt i.e. game bags, plastic gloves for dressing game, a knife a fire kit and even a stove set for a quick cup of coffee or a soup. If I needed more space I could attach additional bags to the webbing on the outside of this M48 Gear Tactical Waist/back pack. There is even a place on the side of the bag to place a 1 liter water bottle. This bag is great and it is only limited to the creativity of the user and for all its zippers they are attached with a cord thus making the pack tactically quiet which is a plus for a hunter. Whether you are a bow hunter or an Air gun hunter or like me a slingshot hunter this is the bag for you. You wont be disappointed!